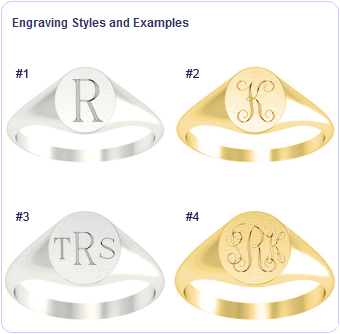 Gold signet rings make wonderful family heirlooms because the original wearer’s initials are preserved. The word heirloom can refer to many different things that your family holds near and dear, such as antiques and even jewelry that has been passed down through generations of family members. These are items that hold a meaning more valuable than their financial worth as they have a personal importance. Among the most popular family heirlooms are gold signet rings. A gold signet ring can be worn by either a man or a woman and features one, two, or three initials. The three initial monogram is the most popular, with the last name initial being featured in the middle of the other two. These rings are generally held onto and passed down because when you wear the ring, it is a way to remember whom the ring first belonged. Many women enjoy wearing a gold signet ring before they are married with their maiden name’s initial being featured. They may choose to continue to wear this ring after they are married on a different finger or hand. Perhaps gold signet rings that you once owned will continue to be passed down and enjoyed as a way to celebrate you and your life. What are some family heirlooms that your family has continued to pass down from generation to generation? Please share your stories with us in the comments section.